1948-49 1x air-mail letter to Czechoslovakia, with Mi.126, CDS Melbourne 19.Apr.48 + 2 pcs of FDC, 1x to Czechoslovakia as Registered with block of four stamp. Mi.191, 1x with Mi.197. Without damage. 1970 FDC with stamp. Mi.432-33, Expo 70. 1970 FDC with stamp. Mi.434-45, Royal visit. 1970 FDC with stamp. Mi.436, Grasslands Congres. 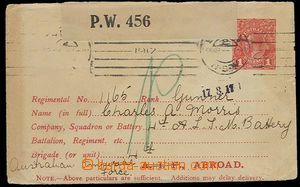 1940 PRISONER OF WAR MAIL envelope with cancel. Services of Prisoners of War to Shanghai, sender Internment Camp No.3 Tatura with date 21.Dec.1940, arrival postmark., censorship. Without damage. 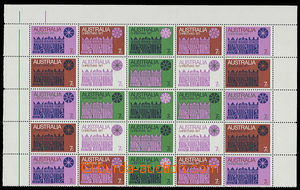 1964 stamp booklets B34, incomplete, missing 1 sheet 5d stamps. 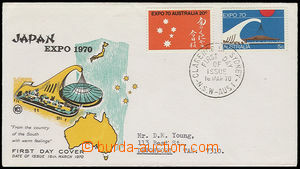 1970 FDC with stamp. Mi.436, Grasslands Congres issued company Royal with 2 stamp. 1966 Mi.62-73, overprint issue change currency, superb. 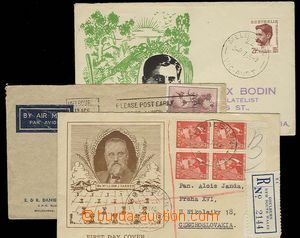 1952-60 Mi.22-23, stamps with overprint SPECIMEN, superb.